1. What is iSCSI Cake(CCDisk)? iSCSI Cake is a storage server which exports a server's storage resources to clients. The clients can access an iSCSI disk as a local hard disk. The iSCSI disk supports all normal disk operations including read, write, format and partition. 2. What is the difference between iSCSI Cake (CCDisk) and other iSCSI targets? iSCSI Cake is the first iSCSI target to support VMWare file disk. VMDK file can be exported to clients as local disk which provides users another storage virtualization solution. 3. What are the other notable features of iSCSI Cake (CCDisk)? Server's data is protected by copy-on-write mechanism. Client's write requests are redirected to working directory without modifying server's data. 4. What is the difference between iSCSI Cake (CCDisk) and SMB? SMB protocol shares data at the file system level while iSCSI shares data at the block level. Mapped network drives do not support applications such as databases which require local drives and games while iSCSI Cake has no such limitation. iSCSI Cake supports storage sharing through WAN while SMB can only be used within LAN. 5. Who needs iSCSI Cake (CCDisk)? System administrators in enterprise storage center, internet Cafes. They will no longer need to install software on every client computer using iSCSI Cake. And they do not need to worry about data safety any more. 6. Can iSCSI Cake (CCDisk) work alone? 7. How can I save my data on server? Only super client can change server's data. First, you need to enable super client in disk property. Second, a password (12-15 characters) must be setup in setup panel. Third, client must log on server with CHAP. The icon for super client is different in client list view. 8. How many LUNs does iSCSI Cake (CCDisk) support? Current version supports up to 16 LUNs per client. However, user can assign different disk to different client. 9. How can I connect iSCSI Cake (CCDisk) server through port forwarding? You can change the server IP in iSCSICake.ini to the address your initiator can see and restart service. For example, iSCSI Cake server's LAN address is 192.168.0.1, and the WAN address of router is 72.87.118.226. In this case, the server IP in iSCSICake.ini should be changed to 72.87.118.226. 10. How to boot Win2003 with iSCSI Cake? 11. Instructions for iSCSI Cake cache. There are two types of cache: server cache ("Cache size" under "Target setup") and client cache (cache under "Initiator setup"). Server cache - it is cache on iSCSI Cake server. iSCSI Cake will allocate an area from system memory for this cache. BTW, This cache is only for client reading. Client cache - This is cache on the client, and it can be used for both read and write cache. To use this feature, you need to first install MS iSCSI Initiator, then install iSCSI Cake Client on the client computers. 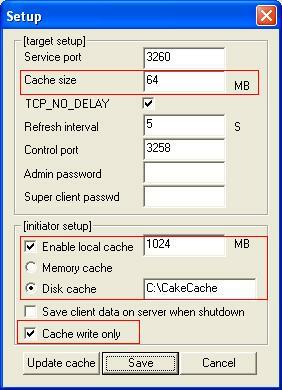 Enable local cache - Only after you have installed iSCSI Cake Client, this option will be available. It's used for specifying the cache size on client. Then you need to select use "Memory cache" or "Disk cache". Memory cache - If you select the "Memory cache", iSCSI Cake Client will allocate an area from system memory for this client cache. Disk cache - If you select the "Disk cache", iSCSI Cake Client will create an folder as you specified (like C:\CakeCache) on the hard disk for this client cache. Cache write only - If you select the "Cache write only", this client cache will be used for only write. If you do not select this option, this client cache will be used for both read and write.